We recently published a post revealing which phone, internet, and TV providers offer discounts for veterans. It turns out that some of the same providers, along with several others, have special packages offering phone and internet discounts for older people as well. While these types of discounts aren’t as widespread as we’d like to see, they are some providers who understand that many older members of the population, especially those who are retired, aren’t earning as much as younger folk. Therefore, they’ve tailored packages, pricing plans, or discounts to give them a break. In this post, we’ll reveal which US phone and internet providers offer senior discounts, before detailing some offers that UK residents can take advantage of. Let’s jump in! In the US, several providers offer discounts solely based on age, with eligibility starting anywhere from the ages of 55 to 65. However, some discounts are exclusive to those with AARP membership. Anyone over 50 can join AARP for $16 per year and gain access to deals on things like travel, dining, entertainment, and apparel. Providers offering exclusive AARP discounts include AT&T, Cricket Wireless, and Consumer Cellular. We’ll delve into the details of those offers in their respective sections below. T-Mobile offers a special deal called Unlimited 55+ to anyone over the age of 55. For $60 per month you can get two lines with unlimited talk, text, and 4G LTE smartphone data. However, only the primary account holder has to be over 55 to take advantage of the offer. The price includes taxes and fees as well as the AutoPay (the T-Mobile automatic payment system) discount of $5. Existing customers can sign up over the phone, but new customers will have to visit a store and present a government-issued ID to prove their age. 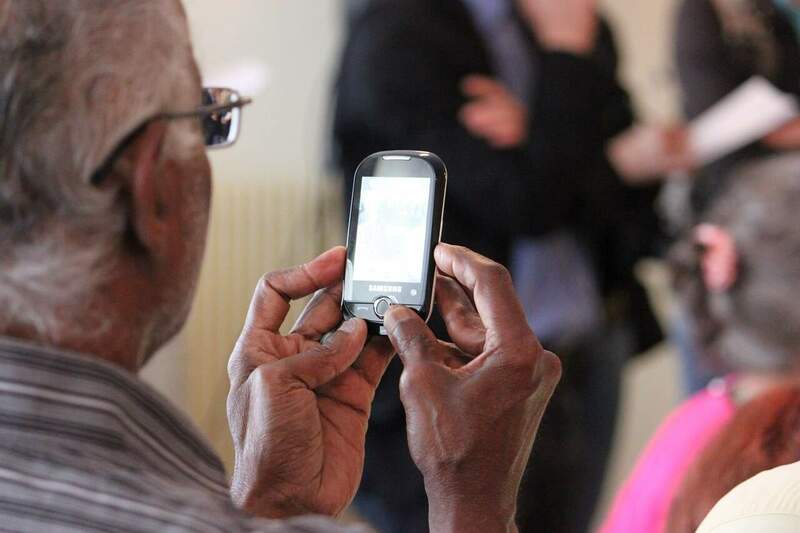 The AT&T Senior Nation plan is targeted at basic phone users over the age of 65. For $29.99, you can get 200 Anytime Minutes, unlimited Mobile to Mobile Minutes (to AT&T Mobility customers), and 500 Nights and Weekends minutes. This applies to nationwide calling and no roaming or long distance charges will be applied. Note that this is only open to basic phone users and is not available for smartphones or tablets. The offer can be accessed over the phone or in-store, but not online. There is also an exclusive AT&T discount offered to AARP members. This takes 10% off monthly recurring fees on qualified voice and data wireless plans. Verizon Wireless also offers a discount to those over the age of 65. However, it’s only available to existing customers. Pricing for the Nationwide 65 Plus plans varies greatly as users have multiple options when it comes to number of lines, number of messages, and amount of data. A basic single-line voice plan is $29.99 for 200 Anytime Minutes. Verizon does also participate in the Lifeline program which offers savings to low-income customers. There is a discount available for both phone and internet services. If you’re in Arizona, another provider that offers Lifeline services is CenturyLink. Lifeline qualifiers who are 65 or older can get the Lifeline discount of $9.25 per month, as well as an additional variable discount. Cricket Wireless doesn’t have a specific seniors’ plan, but it does offer a rebate to AARP members. When you buy a wireless phone from Cricket, you can receive a $20 mail-in rebate Cricket Visa Promotion Card. The card can be used to pay for wireless services for up to 150 days after issuance. Each AARP member can receive rebates on up to five lines per household. Rebates are also available to existing customers on phone upgrades every 24 months. Charter Spectrum is one of the few internet providers offering a discount to seniors. The Spectrum Internet Assist program is available to any household in which at least one person is a member of the Supplemental Security Income (SSI) program and is over the age of 65. It’s also open to those on the Community Eligibility Provision (CEP) and the National School Lunch Program (NSLP). A low price of $14.99 per month will get high-speed internet with no data caps, modem included. Wifi can be added for an additional $5 per month. Bear in mind that the plan and its price are not heavily promoted so make sure to ask. Bonus tip: New phones can be very expensive, buying a used phone could save you 50% or more. In the UK, providers are a little less willing to offer breaks to seniors. However, there are still a few ways to cut those bills and save a little money. If you’re a Virgin Media customer, then you may already know about their Talk Protected plan. This freezes home phone line rental charges for elderly and disabled customers. As of January 2017 they were set at £17.99 per month with no future increases planned. Customers can also receive £5 off other eligible Virgin Phone plans. BT offers the BT Basic plan to a range of customers, including those receiving the Pensions Credit benefit. The budget service provides a low monthly rental fee along with a call allowance. It claims to be simple, but it seems to be a little confusing at first. BT Basic costs £5.10 per month, including £1.50 to spend on calls. It also includes free weekend calls (up to 60 minutes) to 0845 and 0870 numbers (often used by banks and utility companies, among others). Additionally, you can pay up to £10 extra per month to make calls to UK mobiles. The £10 price cap means you can make unlimited calls. However, there is a ‘fair use policy’ in play here, so if BT thinks a customer is using the offer ‘excessively’, they may be in touch. If you want access to both phone and internet, then BT Basic + Broadband sounds like a great deal. For £9.95 per month, you get the phone line rental mentioned above, along with 17 Mb/s internet and 12GB of data per month. The application process for these packages is a little convoluted. You have to call to receive a form, and once you return it, you might wait up to thirty days to find out if you’ve been accepted. Another area where UK seniors can save is their TV license. Every UK resident who owns and operates a television is required to pay £147 per year for a TV license. However, if you’re over 75, you can get your license for free. For the initial free license, you have to actually apply, but subsequently it will automatically be renewed every two years. If you’re renewing your license at the age of 74, you can apply for a short-term license so you’re not paying past your 75th birthday. No matter where you are, choosing the right provider and plan can be a daunting task. However, there are some basic tips to can follow to ensure you get the right deal. Just because a provider offers a special deal for seniors doesn’t necessarily mean it’s the right deal for you. If you’re going to end up paying for additional features that aren’t included in the offer package, you may be better off going with a different plan altogether. Compare the prices offered by various providers as well as the different plans each one has. One of the problems when comparing different providers is that they all lay out their pricing differently. For example, some include taxes and fees in their prices while others don’t. Also, some providers charge exorbitant amounts if you exceed plan limits, such as those for minutes or data. What’s more, there may be one-off or additional fees, such as for equipment or installation. Check the fine print to see exactly what you will be paying up front and each month. Since prices and package features are listed online or on flyers, it may seem like they’re set in stone. However, there is often some wiggle room so it’s always worth asking. The representative you speak to may be able to lower the monthly rate, extend an introductory rate, or add some perks to the package. Many people end up sticking with the same provider simply to avoid the hassle of switching. However, you could save lots of money in the long run if you’re willing to change things up now and again. New customers often get fantastic introductory rates, with periods ranging from several months up to a year. If these are followed by steep increases, then you could simply switch when the offer expires and take advantage of another provider’s new customer deal. However, bear in mind that some providers charge hefty early cancellation fees. This is yet another reason to read the small print to know what you’re getting into! Do you know of any offers available for seniors? Let us know in the comments box below!